Cancer April 2016 Horoscope forecasts that emphasis will be on career due to the concentration of planets in the Northern half of your natal chart. After the 14th, planet Mars will influence your career prospects with more aggression. The Cancerians will try to enhance their personal image in April 2016 which will be beneficial for professional growth. Your career will be guided by spiritual masters and by your perception. If you devote yourself to humane causes, they will have valuable effect on your career. With your diligence you will succeed in your ventures. 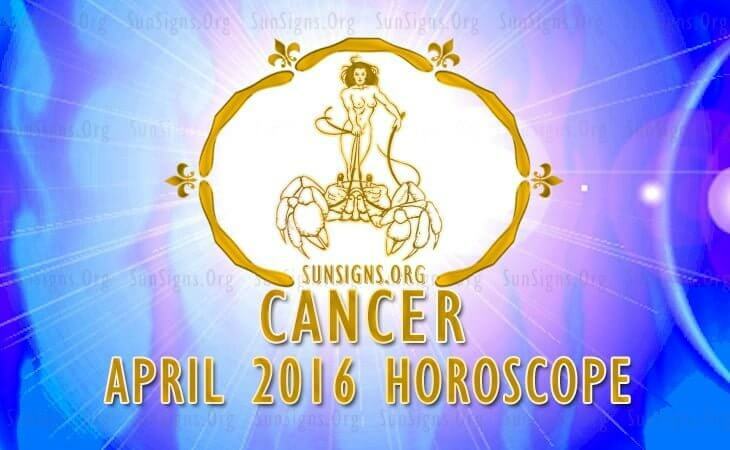 The Cancer April 2016 monthly forecasts predict that career prospects will be excellent till the 19th. Pending promotions and rewards will fructify during the month. The Solar Eclipse of the 19th envisages changes in your career as well as in the organization you are connected with. The course of business and jobs may change directions for some Crabs while some may have conflict with their companies. Businessmen should be cautious while selecting people while job seekers have to be extra careful before accepting new jobs in April 2016. Crabs, you will be financially more prosperous during April 2016 with money coming from your career or with the support of family elders and superiors. Your social group will enhance your finances after the 20th. Investments in farm goods and real estate will yield good profits. The Solar Eclipse will be responsible for your future monetary plans. You have to review and rectify any mistakes in your fiscal strategies. Investment plans and organizations run by Cancer personalities may undergo major overhauls. The Cancer love astrology predictions for April 2016 suggest that the state of love affairs will see a slow transformation. Things will become clear after the 5th. You can also see your 2016 numerology horoscope to know more. Cancer love relationships will start blooming again and existing ones will become stronger. There will be overall improvement in the financial status in the family and all of them will be charitable. After the 19th, you will spend enough time on romance and partying. This is a good month for you to plan to get pregnant. The health of Cancer zodiac sign people will be delicate till the 20th and requires proper care. Influence of Mars will force you to be energetic and this will drain out your vitality. You should take enough rest and stick to proper exercise and nutrition routines. You should control your aggression and divert your extra vigor towards sports and athletics. To conclude, the April 2016 Cancer horoscope predicts that finance and profession will go hand in hand this month.